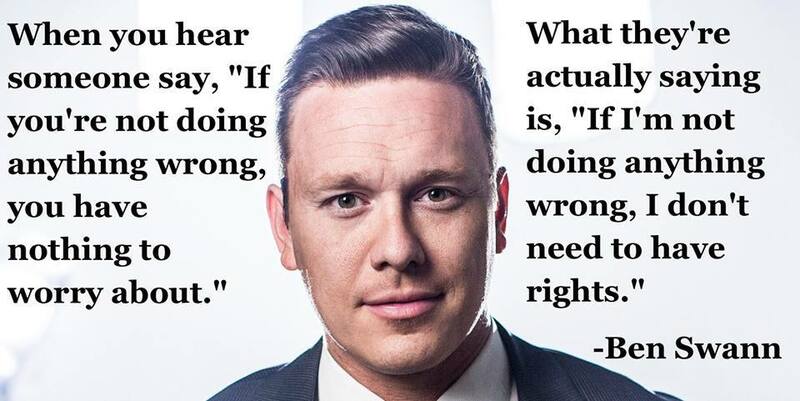 from Ben Swann, investigative reporter. He was the sole reporter to ask Obama about the constitutionality of the drone strike program in 2012. So… the continuing story of Edward Snowden’s flight from prosecution is on everybody’s front page today. Did he leave Russia? Is Cuba his final destination, or will he head to Ecuador? Is Iceland really trying to negotiate a response to the US should their Pirate Party friends decide Snowden deserves sanctuary? In other words, the MSM is trying to change the focus of the story from what Snowden did (and what was in the documents he leaked) to the chase. That’s a really useful thing to do if you don’t want to look at what the American Security apparatus is up to. David Seaman makes an interesting argument about the indictment against Snowden, which accuses him of espionage. As one of my buds on FaceBook pointed out, “The media wants you to focus on Edward Snowden’s character and his flight for safety, while ignoring the real issue: if telling the American people they are being illegally spied on millions of times daily is “aiding the enemy,” have we become the government’s enemy?” In other words, when did normal ‘Muhricans’ become guilty-until-proven- innocent suspects to be subjected to a permanent state of surveillance? The same dynamic is at work in the Bradley Manning trial, which has fallen off the media radar. Where’s the reporting about the fact (revealed by Manning) that an American corporation with a couple billion worth of contracts with the Afghan government was engaged in child prostitution? How about the fact that Obama has squelched war crimes trials for his predecessors? Why were we training the Egyptian police in torture? All of those things were revealed in the Wikileaks dump, but maybe 10% of Americans know about them. Instead, we’re subjected to the talking heads bloviating about whether Wikileaks is practicing journalism. Like the punditocracy would know. Here’s my .02 based on what’s going on–we are engaged in journalism by distraction (Gosh, are we debating abortion again? Did somebody with the last name Jackson show up in an ER?). There are subjects that are off-limits for discussion in this country. We can’t discuss Climate Change or (especially)Peak Oil in any meaningful way. Nobody in MSM wants to poke cases like that of Michael Hastings’ increasingly suspicious death (never mind the cases before it). The 9/11 conspiracy movement continues to make provable allegations about the questions surrounding that day, even while ‘reputable’ organizations work to look at almost anything else. And the Obama administration has criminalized the viewing of Wikileaks–they are pretending that the files are still technically top secret and any government employee who downloads them faces sanctions (Ask Peter van Buren). So here’s my question, and it’s admittedly a tinfoil hat question–what is out there in all those documents? Is there some smoking gun in the tens of thousands of leaked documents that leads to answers on some of these issues? Does the US government already know (and has it been planning for) massive civil unrest once oil gets too expensive to keep suburbia going? Does it have information about 9/11 that it never planned to share? Is there damning information out there equivalent to a ‘Berlin Wall’ moment–a time when the government’s facade of competence shatters irretrievably, and the people with pitchforks come into the streets to dispatch all of the suited criminals and their enablers? What if the conspiracy is about keeping us distracted enough by the indictments and prosecutions to stop looking at the sign-posts in the data already dumped? What if the next Jeremy Hammond or Bradley Manning is already mining the data that shows something that would pose an existential crisis for the United States–something that the powers-that-be REALLY don’t want exposed? I was right–Snowden has apparently packaged cables and documents as a ‘poison pill’. Per Glenn Greenwald, there is a treasure-trove of encrypted files that were the basis of The Guardian disclosures. These have been archived and distributed by Snowden to associates, with Greenwald in possession of the passwords. these are the raw, un-edited transcripts of emails and cables–the things that Greenwald bragged had been edited out. More about this development here. ← POSTPONED->Julian Assange will make a speech this Saturday from the Ecuadorian Embassy – c’mon over!